Most fans of “Top Chef” Chef love Carla Hall, a finalist on her season and a subsequent Top Chef All Star, winning the “Fan Favorite” award. She went on to become a cohost on “The Chew” and to start Carla Hall Petite Cookies, an artisan cookie company that specializes in teeny cookies. A brilliant idea for people who need just a bite, the cookies are either half-inch cubes or one-inch drop cookies, depending on the nature of the dough. They’re meant to pair “boldly and beautifully,” according to Carla, with beer, wine, tea and coffee. For home, entertaining and gifting, we’ve been charmed by these little cookies. Made in small batches, every step from mixing the dough to packaging is done by hand. Of course, only the finest ingredients are used: European-style butter, unbleached sugar and flour, couverture chocolate, artisan cheeses, fresh nuts, premium spices and, says Carla of her most important ingredient: love. 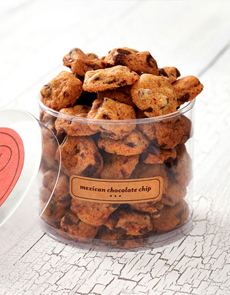 Mexican Chocolate Chip Cookies, teeny bites of heaven. Carla Hall Petite Cookies. A gift box for any cookie lover. Photo courtesy Carla Hall Petite Cookies. 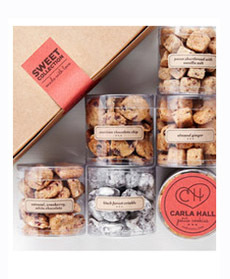 Most definitely, the Sweet Collection Gift Box, which includes six of the seven varieties of sweet petites. It’s $25.00; there’s a smaller box with three varieties for $12.50. If you want to include a signed copy of Carla’s cookbook, Carla’s Comfort Foods: Favorite Dishes from Around the World—you can add it to the Sweet Collection gift box for a total of $45.00. There are other gift options, other goodies, and of course, you can buy individual packages of whatever you like. Head to CarlaHall.com to get yours. Or, find a retailer near you. Fans of Top Chef may remember that Carla spent several years working as a model on the runways of Paris, Milan and London. It was in Paris that she fell in love with the art of food. But what most people don’t know is that before heading to Europe, Carla spent two years as a CPA at Price Waterhouse. When she returned from Europe, she attended L’Academie de Cuisine in Maryland where she completed her culinary training and began her career as a professional chef.